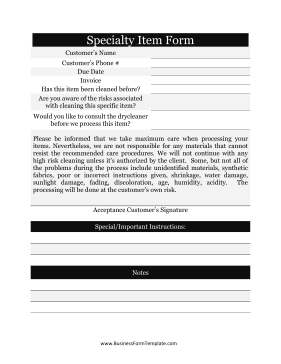 This specialty item form can be used by cleaning businesses to record special instructions and potential problems involved in cleaning certain items. This not only protects the business from accusations of bad service, but also helps the customer understand the cleaning process. Has this item been cleaned before? Are you aware of the risks associated with cleaning this specific item? Would you like to consult the drycleaner before we process this item? Please be informed that we take maximum care when processing your items. Nevertheless, we are not responsible for any materials that cannot resist the recommended care procedures. We will not continue with any high risk cleaning unless it's authorized by the client. Some, but not all of the problems during the process include unidentified materials, synthetic fabrics, poor or incorrect instructions given, shrinkage, water damage, sunlight damage, fading, discoloration, age, humidity, acidity. The processing will be done at the customer's own risk.